Defending Olympic Taekwondo champion Jade Jones has retained her gold medal in Rio. The victory was Team GB's third gold medal on Thursday after Alistair Brownlee won the Triathlon and Hannah Mills and Saskia Clark took gold in the sailing. Team GB's medal tally now stands at 56. 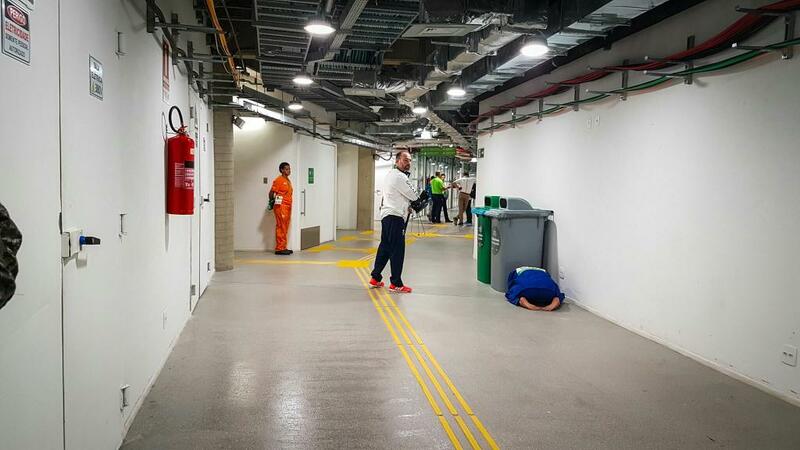 Team GB's Ashley McKenzie broke down in tears by the bins after he was knocked out of the -60kg category of judo. Sports journalist Ollie Williams tweeted the picture, which McKenzie himself later shared. "Thank you all for your support...my journey has been tough but you've all helped!" McKenzie said. The British Commonwealth champion lost by a single yuko point to Yeldov Smetov on Saturday. Team GB judo star Gemma Gibbons has revealed the bruises she endured to claim a remarkable Olympic silver medal in her home city. The south Londoner's boyfriend Euan Burton, a fellow Team GB judo fighter, tweeted the picture, showing Gemma's left hand blackened by the impact of her Games campaign. Confirming that Gemma's hand was "pretty sore," Burton added his admiration at her stunning achievement, saying, "She won silver fighting four of five fights like this!" Gemma Gibbons aunt Karen said she "couldn't be prouder" after watching her win the a silver medal in the women's under 78kg judo. Karen said her sister, Gemma's mum, started her career by starting her in lessons when she was just six. Her boyfriend Euon Burton, a judo athlete who was defeated in the second round of the men's 81 kg competition, said he was so delighted "by how she smashed it" today. He said the margin between her and Kayla Harrison was so small she could have become an Olympic champion, but that she was still a champion "in our eyes and hearts." Gemma Gibbons cried as she was received her silver medal in the women's under-78kg judo. She told the BBC she was very disappointed not to claim gold but hoped her winning a medal would raise the profile of judo across the UK. Team GB judoka Gemma Gibbons paid tribute to her later mother as she grappled her way to Olympic silver. Her mother introduced her to the sport when she was six, but died in 2004 from leukeamia. Friends and family were part of the boisterous crowd of British fans inside the Excel Arena where they chanted her name, clapped and stamped throughout her winning run. Team GB's Gemma Gibbons has won the first women's judo medal for twelve years. She was beaten in the final by the USA's Kayla Harrison. Kayla Harrison is the first woman from the USA to win a medal in women's judo.